These packs were distributed at a Toys R Us event in late 01/early 02 and included the exclusive P1, P2, and P3 Gahlok cards (the 'P' stands for preview I think!). 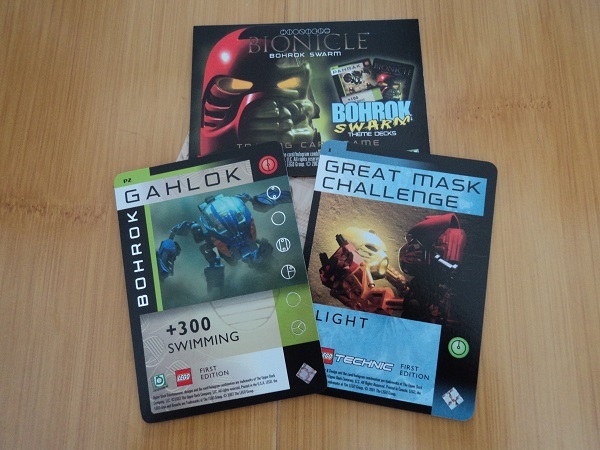 There aren't many Bionicle trading cards rarer than these! Each of the 8 packs I've got contains one randomly packed Preview card, plus a first edition ultra-common card from the theme decks, and an ad card. If you haven't got any of those cards on-hand, I'd also be interested in trading for Kanohi, Slizer discs, and miscellaneous promo material/paraphernalia from 2001-2003. Let me know! Edited by Peri, Jul 17 2018 - 02:46 PM. You can slide the cards around in the packs to see the codes on the edge. I bought a store-pack back in the day. I wanted the bag of orange Krana but also got cards, posters and a few printed mylar balloons. I still have a stack of the posters. Oh nice! Thanks for the tip, OP is now updated with the contents of the packs. I have 143, 189, 219, 300, 305 (it's a Reward), and 308, all first edition. I have 188 1st Ed and 189 Unlimited Ed, if you are interested? I have a few questions. What are T1 and T2 cards? never heard of these. Hey, I have a few questions. What are T1 and T2 cards? never heard of these. T1 and T2 were given out at QFTM tournaments at Lego stores in 01 - T1 for participating, T2 for winning. There weren't many of those tournaments, so the cards are super duper rare. This old BZP reference page has some decent scans of them. As for the rest of your post - PM sent! Edit: if you do happen to find a spare of either of the tournament cards, I'd be happy to trade you the silver letter kopaka for it. Edited by jchavoya, Jul 17 2018 - 06:17 PM. There are still the German versions of cards 1-220 too . 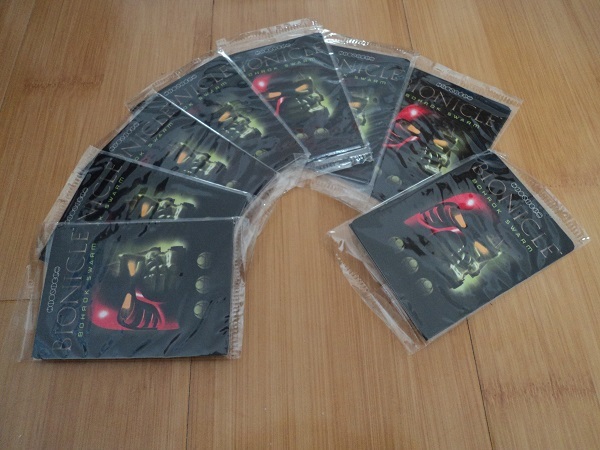 I think only printed in 1 edition but i could be wrong about that haha. Do any of you happen to have any spare Kanoka cards lying around? I'd be willing to trade some of the cards for those.